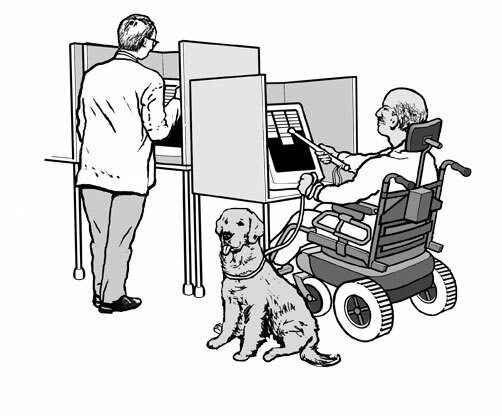 Easter Seals, AAPD and the REVUP campaign created a checklist for voters with disabilities. Download their voting resource card to take with you to the polls! The American Association of People with Disabilities (AAPD) has compiled an extensive voter resource center to help people register to vote, learn about the issues and organized the disability vote. The REV UP campaign, a project of AAPD, aims to increase the political power of the disability community, while also engaging candidates and the media on disability issues. One Vote Now, a collaborative project between National Association of Councils on Developmental Disabilities, DREDF, AAPD, RespectAbility and the National Disability Rights Network, is working to enhance the voting bloc of people with disabilities. The Voting Information Project supports a SMS Tool that provides voters with election information via text message. By texting “VOTE” or “VOTO” to GOVOTE (468-683), voters can find polling places, contact information for local election officials, and registration URLs. The app is available in multiple languages. In addition, the National Federation of the Blind (NFB) is partnering with Lyft, a popular ride-hailing app, to help blind voters get to the polls. Lyft has provided NFB’s national headquarters with a number of promotion codes, worth $15 each, which are being distributed through eleven of their affiliates: Colorado, Massachusetts, Maryland, Nevada, Ohio, Tennessee, Texas, Utah, Virginia, Washington and Wisconsin. Contact your affiliate president if you could benefit from one of these codes, contact information is here: complete list of our affiliates and their leaders. The Arc of the United States’ Voter Support Service for people with disabilities is a site that helps voters report and resolve voting barriers in real time.